Guides, grids, and rulers are used to accurately place and measure objects on an artboard. Guides, grids, and rulers are useful because objects can be snapped to them, which ensures proper alignment within the document. They can easily be created using various methods, and they can be locked, hidden, moved, and cleared. In InDesign , these tools function in a very similar way. They can be used to create grid-based documents , for example. Guides are created by clicking within a ruler and dragging the guide onto the artboard. To create a horizontal guide, click on the global ruler running horizontally across the top of the workspace; to create a vertical guide, click on the global ruler running vertically along the left side of the workspace. Guides can also be created by selecting any path (straight, angled, or curved) and clicking View->Guides->Make Guides (or pressing Ctrl+5). To change it back to a path, select the guide and click View->Guides->Release Guides (or press Alt+Ctrl+5). To place a guide more precisely, select a guide by clicking on it. The toolbar should now say "Path." If the guide is vertical, enter a specific location for its X position. If the guide is horizontal, enter a specific location for its Y position. This will change the guide's location in reference to the artboard ruler. Guides are locked by default. To unlock them, click on View --> Guides --> uncheck Lock Guides (or press Alt+Ctrl+;). A way to lock guides without going into the menu options is to put all the guides (or a specific set of them) on a different layer, and then lock the layer. The Guides menu options also include clearing and hiding guides. Rulers are helpful for checking dimensions within the document. Click on View --> Show Rulers, or press Ctrl+R. The rulers that show up are global rulers; their zero point is fixed regardless of which artboard is selected. To change the ruler measurement system, right click on a ruler and select the measurement. 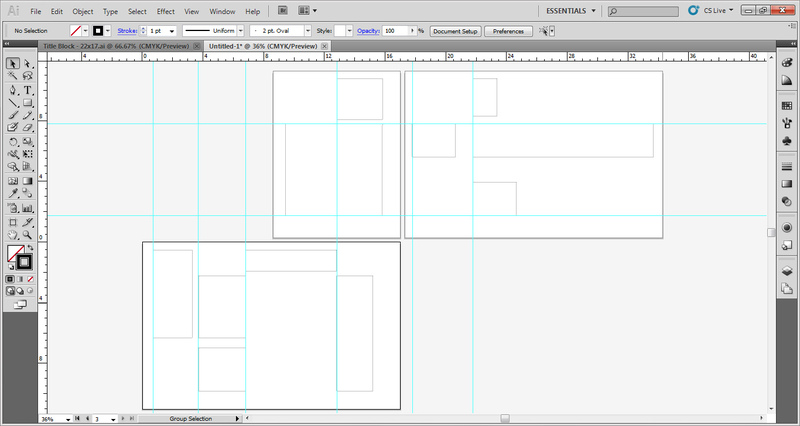 Confirm that the artboards are sized correctly. Artboard Rulers sets the zero point of the ruler at the edge of the active artboard. To show these rulers, click on View --> Show Artboard Rulers, or press Alt+Ctrl+R. Selecting a different artboard changes the zero point of the rulers. Retrieved from " http://studiomaven.org/index.php?title=Tool:Part_111635 "